This is how you get all your kisses full of Spring/Summer. With shades as bold as ever, I'm so thrilled that I even get to keep using my berry tones. 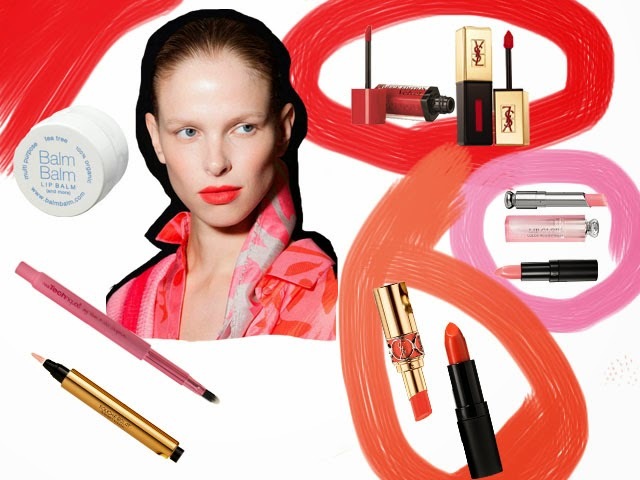 This season the lipstick tricks are more in the way you apply it rather than what shades you apply. First things first, the final look should be sheeny to some extent, sort of stain-like. Before you binge on the lip glosses, sheeny is not glossy so if you are going to swap anything in your make-up bag it is going to be them. To achieve this look it is pretty easy. Instead of applying lipstick straight from the the tube, use a lip brush. If you are going to invest in a good lip brush I suggest the Real Techniques Retractable Lip brush, not only because Real Techniques are the best budget brushes there are but also because it's hand to slip into your handbag for any touch-ups. Don't panic without the glosses! If you're all for shiny lips then you'll be using your lip balm/oil over lipstick too like the Balm Balm Organic Lip Balm or the Trilogy Rosehip Oil Lip Balm. Applying some over your lipstick will not only give you the much needed moisture in the warm days but also the natural shine that adds to the overall glow. Final trick of the trade is to contour the edges of your lip with concealer like the Maybelline New York Dream Lumi Touch Highlight Concealer or the YSL Touche Eclat. This will soften the edges making it look fresh and light while highlighting your pout.